Stulp, F., Buchli, J., Theodorou, E., Schaal, S.
Applying reinforcement learning to humanoid robots is challenging because humanoids have a large number of degrees of freedom and state and action spaces are continuous. Thus, most reinforcement learning algorithms would become computationally infeasible and require a prohibitive amount of trials to explore such high-dimensional spaces. In this paper, we present a probabilistic reinforcement learning approach, which is derived from the framework of stochastic optimal control and path integrals. The algorithm, called Policy Improvement with Path Integrals (PI2), has a surprisingly simple form, has no open tuning parameters besides the exploration noise, is model-free, and performs numerically robustly in high dimensional learning problems. We demonstrate how PI2 is able to learn full-body motor skills on a 34-DOF humanoid robot. To demonstrate the generality of our approach, we also apply PI2 in the context of variable impedance control, where both planned trajectories and gain schedules for each joint are optimized simultaneously. Johnson-Roberson, M., Bohg, J., Kragic, D., Skantze, G., Gustafson, J., Carlson, R.
Gratal, X., Bohg, J., Björkman, M., Kragic, D.
Object grasping and manipulation pose major challenges for perception and control and require rich interaction between these two fields. In this paper, we concentrate on the plethora of perceptual problems that have to be solved before a robot can be moved in a controlled way to pick up an object. A vision system is presented that integrates a number of different computational processes, e.g. attention, segmentation, recognition or reconstruction to incrementally build up a representation of the scene suitable for grasping and manipulation of objects. Our vision system is equipped with an active robotic head and a robot arm. This embodiment enables the robot to perform a number of different actions like saccading, fixating, and grasping. 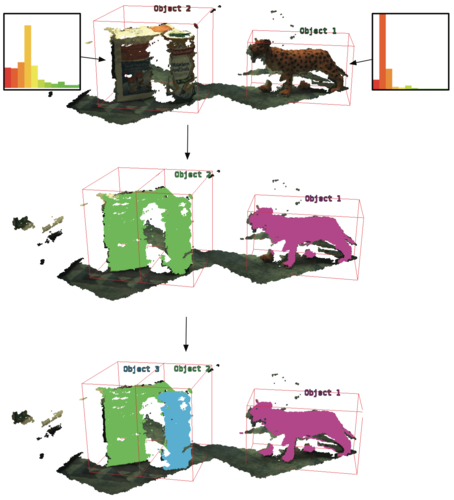 By applying these actions, the robot can incrementally build a scene representation and use it for interaction. We demonstrate our system in a scenario for picking up known objects from a table top. We also show the system’s extendibility towards grasping of unknown and familiar objects. Bohg, J., Johnson-Roberson, M., Björkman, M., Kragic, D.
We propose a method for multi-modal scene exploration where initial object hypothesis formed by active visual segmentation are confirmed and augmented through haptic exploration with a robotic arm. We update the current belief about the state of the map with the detection results and predict yet unknown parts of the map with a Gaussian Process. 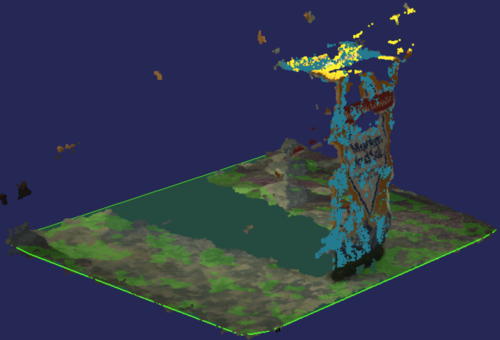 We show that through the integration of different sensor modalities, we achieve a more complete scene model. We also show that the prediction of the scene structure leads to a valid scene representation even if the map is not fully traversed. Furthermore, we propose different exploration strategies and evaluate them both in simulation and on our robotic platform. Johnson-Roberson, M., Bohg, J., Björkman, M., Kragic, D.
In this paper we present a framework for the segmentation of multiple objects from a 3D point cloud. We extend traditional image segmentation techniques into a full 3D representation. The proposed technique relies on a state-of-the-art min-cut framework to perform a fully 3D global multi-class labeling in a principled manner. Thereby, we extend our previous work in which a single object was actively segmented from the background. We also examine several seeding methods to bootstrap the graphical model-based energy minimization and these methods are compared over challenging scenes. All results are generated on real-world data gathered with an active vision robotic head. We present quantitive results over aggregate sets as well as visual results on specific examples. Peters, J., Mülling, K., Altun, Y. Policy search is a successful approach to reinforcement learning. However, policy improvements often result in the loss of information. Hence, it has been marred by premature convergence and implausible solutions. As first suggested in the context of covariant policy gradients (Bagnell and Schneider 2003), many of these problems may be addressed by constraining the information loss. In this paper, we continue this path of reasoning and suggest the Relative Entropy Policy Search (REPS) method. The resulting method differs significantly from previous policy gradient approaches and yields an exact update step. It works well on typical reinforcement learning benchmark problems. Theodorou, E., Buchli, J., Schaal, S.
Reinforcement learning (RL) is one of the most general approaches to learning control. Its applicability to complex motor systems, however, has been largely impossible so far due to the computational difficulties that reinforcement learning encounters in high dimensional continuous state-action spaces. In this paper, we derive a novel approach to RL for parameterized control policies based on the framework of stochastic optimal control with path integrals. While solidly grounded in optimal control theory and estimation theory, the update equations for learning are surprisingly simple and have no danger of numerical instabilities as neither matrix inversions nor gradient learning rates are required. Empirical evaluations demonstrate significant performance improvements over gradient-based policy learning and scalability to high-dimensional control problems. Finally, a learning experiment on a robot dog illustrates the functionality of our algorithm in a real-world scenario. We believe that our new algorithm, Policy Improvement with Path Integrals (PI2), offers currently one of the most efficient, numerically robust, and easy to implement algorithms for RL in robotics. Mistry, M., Buchli, J., Schaal, S.
Model-based control methods can be used to enable fast, dexterous, and compliant motion of robots without sacrificing control accuracy. However, implementing such techniques on floating base robots, e.g., humanoids and legged systems, is non-trivial due to under-actuation, dynamically changing constraints from the environment, and potentially closed loop kinematics. In this paper, we show how to compute the analytically correct inverse dynamics torques for model-based control of sufficiently constrained floating base rigid-body systems, such as humanoid robots with one or two feet in contact with the environment. While our previous inverse dynamics approach relied on an estimation of contact forces to compute an approximate inverse dynamics solution, here we present an analytically correct solution by using an orthogonal decomposition to project the robot dynamics onto a reduced dimensional space, independent of contact forces. We demonstrate the feasibility and robustness of our approach on a simulated floating base bipedal humanoid robot and an actual robot dog locomoting over rough terrain. Kalakrishnan, M., Buchli, J., Pastor, P., Mistry, M., Schaal, S.
We present a control architecture for fast quadruped locomotion over rough terrain. We approach the problem by decomposing it into many sub-systems, in which we apply state-of-the-art learning, planning, optimization and control techniques to achieve robust, fast locomotion. Unique features of our control strategy include: (1) a system that learns optimal foothold choices from expert demonstration using terrain templates, (2) a body trajectory optimizer based on the Zero-Moment Point (ZMP) stability criterion, and (3) a floating-base inverse dynamics controller that, in conjunction with force control, allows for robust, compliant locomotion over unperceived obstacles. We evaluate the performance of our controller by testing it on the LittleDog quadruped robot, over a wide variety of rough terrain of varying difficulty levels. We demonstrate the generalization ability of this controller by presenting test results from an independent external test team on terrains that have never been shown to us. Are reaching movements planned in kinematic or dynamic coordinates? Whether human reaching movements are planned and optimized in kinematic (task space) or dynamic (joint or muscle space) coordinates is still an issue of debate. The first hypothesis implies that a planner produces a desired end-effector position at each point in time during the reaching movement, whereas the latter hypothesis includes the dynamics of the muscular-skeletal control system to produce a continuous end-effector trajectory. Previous work by Wolpert et al (1995) showed that when subjects were led to believe that their straight reaching paths corresponded to curved paths as shown on a computer screen, participants adapted the true path of their hand such that they would visually perceive a straight line in visual space, despite that they actually produced a curved path. These results were interpreted as supporting the stance that reaching trajectories are planned in kinematic coordinates. However, this experiment could only demonstrate that adaptation to altered paths, i.e. the position of the end-effector, did occur, but not that the precise timing of end-effector position was equally planned, i.e., the trajectory. Our current experiment aims at filling this gap by explicitly testing whether position over time, i.e. velocity, is a property of reaching movements that is planned in kinematic coordinates. In the current experiment, the velocity profiles of cursor movements corresponding to the participant's hand motions were skewed either to the left or to the right; the path itself was left unaltered. We developed an adaptation paradigm, where the skew of the velocity profile was introduced gradually and participants reported no awareness of any manipulation. Preliminary results indicate that the true hand motion of participants did not alter, i.e. there was no adaptation so as to counterbalance the introduced skew. However, for some participants, peak hand velocities were lowered for higher skews, which suggests that participants interpreted the manipulation as mere noise due to variance in their own movement. In summary, for a visuomotor transformation task, the hypothesis of a planned continuous end-effector trajectory predicts adaptation to a modified velocity profile. The current experiment found no systematic adaptation under such transformation, but did demonstrate an effect that is more in accordance that subjects could not perceive the manipulation and rather interpreted as an increase of noise. Theodorou, E. A., Valero-Cuevas, F.
Abstract? We provide an overview of optimal control meth- ods to nonlinear neuromuscular systems and discuss their lim- itations. Moreover we extend current optimal control methods to their application to neuromuscular models with realistically numerous musculotendons; as most prior work is limited to torque-driven systems. Recent work on computational motor control has explored the used of control theory and esti- mation as a conceptual tool to understand the underlying computational principles of neuromuscular systems. After all, successful biological systems regularly meet conditions for stability, robustness and performance for multiple classes of complex tasks. Among a variety of proposed control theory frameworks to explain this, stochastic optimal control has become a dominant framework to the point of being a standard computational technique to reproduce kinematic trajectories of reaching movements (see ) In particular, we demonstrate the application of optimal control to a neuromuscular model of the index finger with all seven musculotendons producing a tapping task. Our simu- lations include 1) a muscle model that includes force- length and force-velocity characteristics; 2) an anatomically plausible biomechanical model of the index finger that includes a tendi- nous network for the extensor mechanism and 3) a contact model that is based on a nonlinear spring-damper attached at the end effector of the index finger. We demonstrate that it is feasible to apply optimal control to systems with realistically large state vectors and conclude that, while optimal control is an adequate formalism to create computational models of neuro- musculoskeletal systems, there remain important challenges and limitations that need to be considered and overcome such as contact transitions, curse of dimensionality, and constraints on states and controls. Theodorou, E. A., Buchli, J., Schaal, S.
With the goal to generate more scalable algo- rithms with higher efficiency and fewer open parameters, reinforcement learning (RL) has recently moved towards combining classi- cal techniques from optimal control and dy- namic programming with modern learning techniques from statistical estimation the- ory. In this vein, this paper suggests the framework of stochastic optimal control with path integrals to derive a novel approach to RL with parametrized policies. While solidly grounded in value function estimation and optimal control based on the stochastic Hamilton-Jacobi-Bellman (HJB) equations, policy improvements can be transformed into an approximation problem of a path inte- gral which has no open parameters other than the exploration noise. The resulting algorithm can be conceived of as model- based, semi-model-based, or even model free, depending on how the learning problem is structured. Our new algorithm demon- strates interesting similarities with previous RL research in the framework of proba- bility matching and provides intuition why the slightly heuristically motivated proba- bility matching approach can actually per- form well. Empirical evaluations demon- strate significant performance improvements over gradient-based policy learning and scal- ability to high-dimensional control problems. We believe that Policy Improvement with Path Integrals (PI2) offers currently one of the most efficient, numerically robust, and easy to implement algorithms for RL based on trajectory roll-outs. Investigating principles of human motor control in the framework of optimal control has had a long tradition in neural control of movement, and has recently experienced a new surge of investigations. Ideally, optimal control problems are addresses as a reinforcement learning (RL) problem, which would allow to investigate both the process of acquiring an optimal control solution as well as the solution itself. Unfortunately, the applicability of RL to complex neural and biomechanics systems has been largely impossible so far due to the computational difficulties that arise in high dimensional continuous state-action spaces. As a way out, research has focussed on computing optimal control solutions based on iterative optimal control methods that are based on linear and quadratic approximations of dynamical models and cost functions. These methods require perfect knowledge of the dynamics and cost functions while they are based on gradient and Newton optimization schemes. Their applicability is also restricted to low dimensional problems due to problematic convergence in high dimensions. Moreover, the process of computing the optimal solution is removed from the learning process that might be plausible in biology. In this work, we present a new reinforcement learning method for learning optimal control solutions or motor control. This method, based on the framework of stochastic optimal control with path integrals, has a very solid theoretical foundation, while resulting in surprisingly simple learning algorithms. It is also possible to apply this approach without knowledge of the system model, and to use a wide variety of complex nonlinear cost functions for optimization. We illustrate the theoretical properties of this approach and its applicability to learning motor control tasks for reaching movements and locomotion studies. We discuss its applicability to learning desired trajectories, variable stiffness control (co-contraction), and parameterized control policies. We also investigate the applicability to signal dependent noise control systems. We believe that the suggested method offers one of the easiest to use approaches to learning optimal control suggested in the literature so far, which makes it ideally suited for computational investigations of biological motor control. Gregg, R., Righetti, L., Buchli, J., Schaal, S.
Energy-shaping control methods have produced strong theoretical results for asymptotically stable 3D bipedal dynamic walking in the literature. In particular, geometric controlled reduction exploits robot symmetries to control momentum conservation laws that decouple the sagittal-plane dynamics, which are easier to stabilize. However, the associated control laws require high-dimensional matrix inverses multiplied with complicated energy-shaping terms, often making these control theories difficult to apply to highly-redundant humanoid robots. This paper presents a first step towards the application of energy-shaping methods on real robots by casting controlled reduction into a framework of constrained accelerations for inverse dynamics control. By representing momentum conservation laws as constraints in acceleration space, we construct a general expression for desired joint accelerations that render the constraint surface invariant. By appropriately choosing an orthogonal projection, we show that the unconstrained (reduced) dynamics are decoupled from the constrained dynamics. Any acceleration-based controller can then be used to stabilize this planar subsystem, including passivity-based methods. The resulting control law is surprisingly simple and represents a practical way to employ control theoretic stability results in robotic platforms. 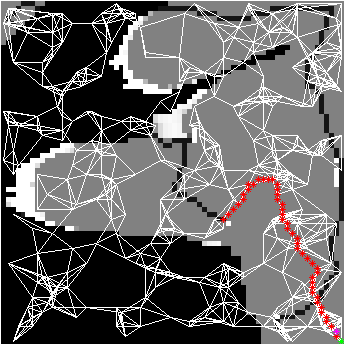 Simulated walking of a 3D compass-gait biped show correspondence between the new and original controllers, and simulated motions of a 16-DOF humanoid demonstrate the applicability of this method. Righetti, L., Buchli, J., Mistry, M., Schaal, S.
Contact interaction with the environment is crucial in the design of locomotion controllers for legged robots, to prevent slipping for example. Therefore, it is of great importance to be able to control the effects of the robots movements on the contact reaction forces. In this contribution, we extend a recent inverse dynamics algorithm for floating base robots to optimize the distribution of contact forces while achieving precise trajectory tracking. The resulting controller is algorithmically simple as compared to other approaches. Numerical simulations show that this result significantly increases the range of possible movements of a humanoid robot as compared to the previous inverse dynamics algorithm. We also present a simplification of the result where no inversion of the inertia matrix is needed which is particularly relevant for practical use on a real robot. Such an algorithm becomes interesting for agile locomotion of robots on difficult terrains where the contacts with the environment are critical, such as walking over rough or slippery terrain. Buchli, J., Theodorou, E., Stulp, F., Schaal, S.
One of the hallmarks of the performance, versatility, and robustness of biological motor control is the ability to adapt the impedance of the overall biomechanical system to different task requirements and stochastic disturbances. A transfer of this principle to robotics is desirable, for instance to enable robots to work robustly and safely in everyday human environments. It is, however, not trivial to derive variable impedance controllers for practical high DOF robotic tasks. In this contribution, we accomplish such gain scheduling with a reinforcement learning approach algorithm, PI2 (Policy Improvement with Path Integrals). PI2 is a model-free, sampling based learning method derived from first principles of optimal control. The PI2 algorithm requires no tuning of algorithmic parameters besides the exploration noise. The designer can thus fully focus on cost function design to specify the task. From the viewpoint of robotics, a particular useful property of PI2 is that it can scale to problems of many DOFs, so that RL on real robotic systems becomes feasible. We sketch the PI2 algorithm and its theoretical properties, and how it is applied to gain scheduling. We evaluate our approach by presenting results on two different simulated robotic systems, a 3-DOF Phantom Premium Robot and a 6-DOF Kuka Lightweight Robot. We investigate tasks where the optimal strategy requires both tuning of the impedance of the end-effector, and tuning of a reference trajectory. The results show that we can use path integral based RL not only for planning but also to derive variable gain feedback controllers in realistic scenarios. Thus, the power of variable impedance control is made available to a wide variety of robotic systems and practical applications. Atkeson, C. G., Schaal, S.
Incremental learning of sensorimotor transformations in high dimensional spaces is one of the basic prerequisites for the success of autonomous robot devices as well as biological movement systems. So far, due to sparsity of data in high dimensional spaces, learning in such settings requires a significant amount of prior knowledge about the learning task, usually provided by a human expert. In this paper we suggest a partial revision of the view. Based on empirical studies, it can been observed that, despite being globally high dimensional and sparse, data distributions from physical movement systems are locally low dimensional and dense. Under this assumption, we derive a learning algorithm, Locally Adaptive Subspace Regression, that exploits this property by combining a local dimensionality reduction as a preprocessing step with a nonparametric learning technique, locally weighted regression. The usefulness of the algorithm and the validity of its assumptions are illustrated for a synthetic data set and data of the inverse dynamics of an actual 7 degree-of-freedom anthropomorphic robot arm.